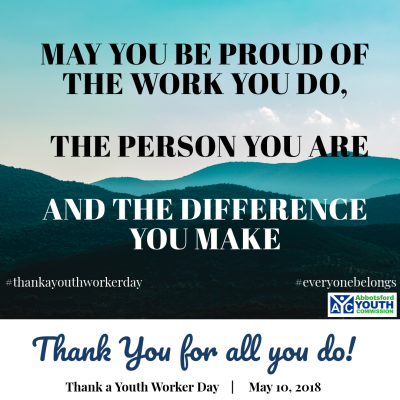 Thank a Youth Worker Day is a joint effort of community partners, youth work organizations, youth and child care workers, and individuals who have signed on to declare an international day of celebrating youth workers. The day is marked by local celebrations of youth work and public relations efforts to encourage people to thank youth workers who make a difference in the lives of young people in their communities. The Abbotsford Youth Commission is a proud partner of Thank a Youth Worker Day! View more information on past Thank A Youth Worker Days. A youth worker is anyone, staff or volunteer, who works with or for the development of children and youth by working directly for or on behalf of kids. Youth workers include: child care providers, coaches, youth ministers, after-school program organizers, recreational leaders, etc. Recognizing youth and child care workers and their efforts contributes to increased productivity, effective work, organizational loyalty, retention, recognition of youth-serving organizations, and, perhaps most importantly, to positive growth in the lives of children and youth and our communities. You just have to sign up. Check out www.thankayouthworkerday.com for more information about becoming a partner.